It was just a matter of time. The transformation of Cleveland’s historic Temple Tifereth Israel into the world-class Milton and Tamar Maltz Performing Arts Center was a long time coming, but it presented a short AV design/install opportunity. The largest new feature at the Milton and Tamar Maltz Performing Arts Center is the 66,000-pound, 80-foot wide canopy suspended above the stage. Made of glass panels and steel tubing, it contains microphones and LED theatrical lighting, as well as speakers directing sound toward the audience. The adaptive reuse project, with an AV budget of $2 million was accomplished through the efforts of Akustiks, SoundCom Systems, Theatre Projects, and MGA Partners Architects. The jewel in the crown is the Center’s Silver Hall, a 1,200-seat space that soars about 80 feet from floor to dome. The sanctuary’s choir loft and carved wooden ark have been retained, and the stage can now be configured into three sizes, extended mainly with hydraulic lifts to accommodate up to 125 musicians. The largest new feature is the 66,000-pound, 80-foot wide canopy suspended above the stage. Made of glass panels and steel tubing, it contains microphones and LED theatrical lighting, as well as speakers directing sound toward the audience. The center’s story began in 2010 when Case Western Reserve University and the temple announced a partnership to renovate this culturally significant and historic HOW into a venue for orchestral, choral, and symphonic music. 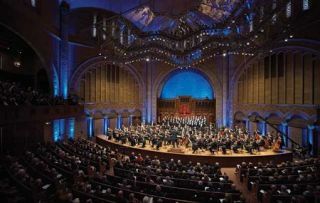 The center, which will present programs and performances in music, dance, and theater, opened in September with a spectacular Cleveland Orchestra concert, “Violins of Hope,” featuring the sounds of some two dozen Holocaust-era instruments. The concert was available on PBS ideastream. The audio system features a Yamaha CL3 mixing console, which controls the audio system in the performance hall. Sparked by a donation from the Maltz Family Foundation of the Jewish Community of Cleveland, and with the aid of dozens of donors, the transformation preserves the iconic structure while advancing the university’s emphasis on culture, creativity, and design. Although the congregation has moved to another sanctuary in Beachwood, OH, the original aesthetic as a place of worship has been maintained in Silver Hall for special services such as those for the high holy days. “We were contracted in late 2012 to design the AV systems,” Lytle said. “The project went on hold in 2014, and then sprung back at the end of that year to fit out the systems for phase one.” (Phase Two is projected to provide new performance spaces, rehearsal studios, and a black box theater). Akustiks was also tasked with gathering feedback from the various constituents who would be using Silver Hall, including those from the Case Western Reserve School of Music, drama, and dance departments, and those using the Hall as an auditorium. The unique project, converting an early 20th century temple into a technology-filled concert hall that preserves the sanctuary aesthetics, is a triumph for the teams that accomplished the mission. The sanctuary’s choir loft and carved wooden ark have been retained, and the stage can now be configured into three sizes, extended mainly with hydraulic lifts to accommodate up to 125 musicians. The systems include a day-to-day speech reinforcement system for presentations and voice reinforcement for the congregation’s use, and a projector and rise-up screen with an architectural element at the back of the room. Another challenge was in making complicated systems easily operational by a single person without technical knowledge. This involved a lot of Crestron controls, so that a professor, for example, could just turn on the system for a presentation, he added. The Crestron system included a DM-MD16x16-RSP router with an assortment of input and output cards. There is a PRO3 with a TSD-2020 touchpanel. There are 48 channels of Millenia mic preamps on the Dante network and 20 Schoeps CMC 6 microphones with an assortment of capsules. Studio monitors include a pair of ATC SCM20ASLs and a pair of ATC SCM100ASLs. The projector is a Digital Projection Highlite Laser projector. The screen is a Vutec Retracta- Vu Pro. Audio processing is handled by a Rane HAL system. The HD-SDI router is a Snell Vega asymmetric 192-point router. There are a host of Plura production video monitors. The speech reinforcement system is handled by d&b’s 24C column speakers. The intercom is Clear-Com’s HelixNet system. With a distinct Byzantine style, the 1924 synagogue’s limestone and travertine marble exterior, gold-tinted dome, and stained glass windows, have made the seven-sided sanctuary a distinct regional feature and earned the building a place on the National Register of Historic Places. In lieu of traditional incandescent fixtures, the arts center opted for an all-LED performance and architectural lighting system. The LED lights require less power and fewer circuits, but they also produce less heat, keeping the musicians more comfortable and allowing Case Western to reduce air conditioning costs. In addition to the front-of-house lighting towers, there are 85 ETC D40 down lights and 12 D40 pars mounted on City Theatrical Auto Yokes. The Auto Yokes and D40 combo units provide adjustable special for the maestro and soloists. Keeping in mind the facility’s continued use as a place for quiet, solemn reflection and acoustic music performance, all performance lighting equipment had to be specified with low-noise or silent standards.